As a really nerdy kid who loved history and books and things like mythology, I'm not sure there was ever a time when visiting Egypt wasn't on my travel bucket list. I wanted to see the tombs of the pharaohs and the ancient temples and the mighty Nile River. I wanted to visit the Pyramids and see all those exotic-sounding cities that I learned about in history class..
And I definitely am not alone. Prior to the Arab Spring and string of revolutions that rocked northern Africa beginning in 2011, Egypt was a hugely popular tourist destination. Everyone wanted that photo at the pyramids and to see King Tut's tomb and to sail on a felucca on the Nile. Pre-2011, Egypt was seeing upwards of 12 million tourists per year. Post-revolution, however, tourist numbers in the country plummeted; at its lowest point, Egypt was getting less than 1 million visitors per year. So many of these boats in Aswan now sit empty. Thankfully, things have finally started to improve in Egypt. While there are still parts of the country that aren't safe for tourists, the vast majority of it (and definitely the major tourist sites) is safe and open for business. So when I was debating over which destination in Africa to pair up with a trip to the Seychelles, my attention immediately went to Egypt. Should you book a tour in Egypt? Once I decided that I wanted to go to Egypt, I began shopping around for group tours in the country. This isn't necessarily because I was afraid to visit Egypt on my own, but more about the fact that I knew I would feel more comfortable in a small group and with a local guide. This would be my first real trip to the Middle East, and I wanted to give myself the best chance of having a positive experience there. I've traveled with small groups all around the world and knew Egypt would be an ideal place to book a tour like this. 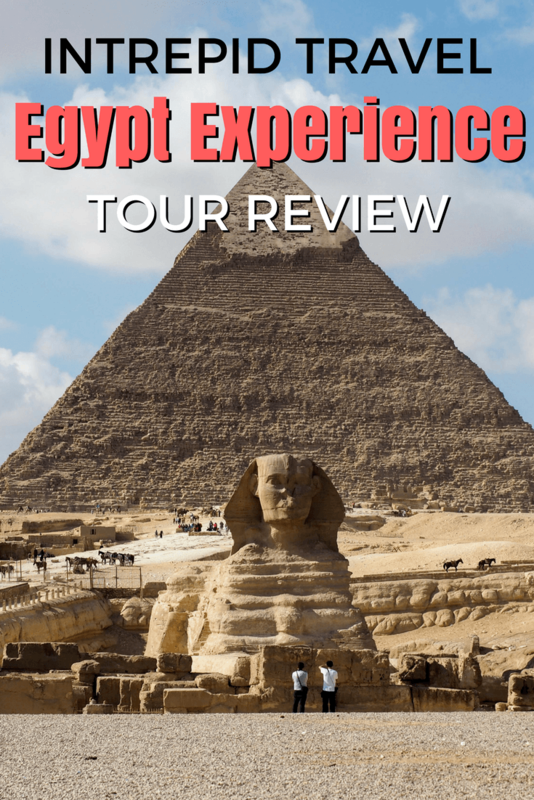 You don't *have* to book a tour in Egypt (plenty of people travel there independently), but after going, it IS a place that I'd recommend exploring with a guide in order to get the most out of your experience. 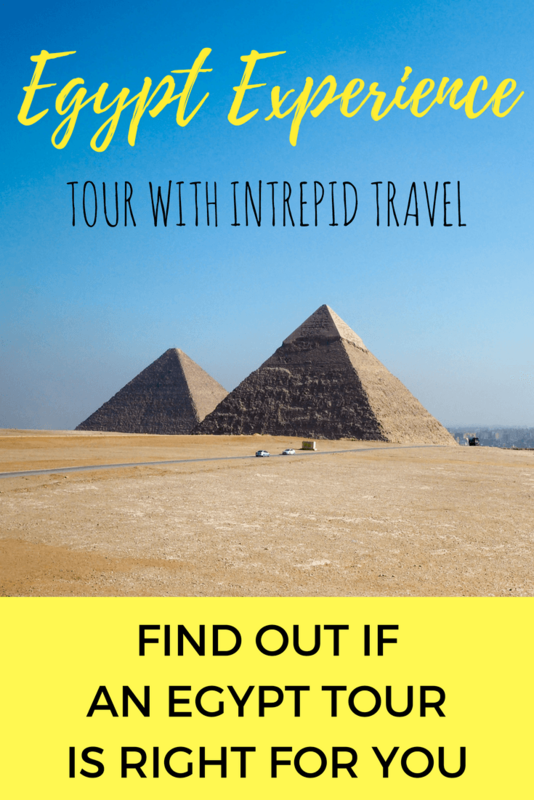 I settled on the 12-day Egypt Experience tour with Intrepid Travel, a company that I've traveled with 6 times previously. This is a “Comfort” trip with Intrepid (the most luxurious trip category they offer), meaning it was going to be a little more comfortable and a little more expensive – but at $2000-$2400 per person, I still think it's pretty affordable for a 12-day trip. You most likely will need a visa for Egypt, but if you're from the US, Europe/UK, Australia, or Canada (as well as several other nations), you can get your visa when you arrive in Egypt. A visa costs $25 USD and is valid for 30 days. When booking this tour with Intrepid Travel, a representative will meet you when you arrive in Egypt and help you obtain your visa, which is a nice bonus. Intrepid Travel does require you to have travel insurance for the entirety of your trip in Egypt. You may be covered under your regular insurance plan, but if you're not, I recommend buying coverage through World Nomads. They offer the most affordable basic travel insurance out there. And if you're wondering what to pack, you can check out my Egypt packing guide! What will you do on this tour? This Egypt Experience tour is absolutely jam-packed with amazing ancient sites and experiences. It hits all the highlights of Egypt and then some. Our guide, Ahmed, was also really intent on making sure that people saw as much as they wanted to. He was always happy to arrange extra outings for us, and usually came along to act as a guide. There is SO much to do and see in Egypt, and this Intrepid tour really ensures that you see a ton of it. I've now traveled with Intrepid on more than half a dozen trips, and the group make-up is always pretty similar. Ages in my group on this trip ranged from mid-20s to mid-60s, with people hailing from Australia, the US, Canada, Scotland, and Switzerland. Intrepid travelers tend to be fairly well-traveled and open-minded, which is one of the reasons I think I keep traveling with them again and again! As always when traveling with Intrepid, our group was small – there were only 12 of us (the max on this tour is 16). And half of the people in my group were solo travelers like me! Intrepid always hires local trip leaders who live in (and in most cases have grown up in) the country you're visiting. Our guide was Ahmed, an Alexandria native who has been guiding tours in Egypt for years. Ahmed was funny and friendly, but also super knowledgable and super passionate about Egypt. 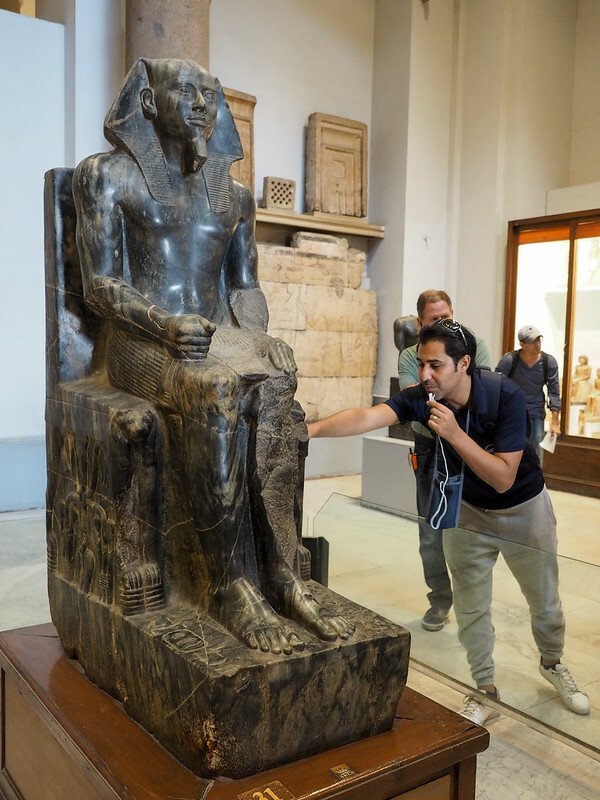 He could read hieroglyphics, knew all the lineages of the pharaohs, and recommended the best places in each city to get falafel (and also, you know, made sure we all got where we needed to be safely). I think the biggest benefit of traveling in a small group is having a guide; you end up seeing and learning so much more than you would on your own. And Ahmed was one of the best guides I've ever had on a tour! As far as transport goes, this tour was quite varied! We traveled in a private mini bus in every city, spent one night on the train between Cairo and Aswan, and flew between Aswan and Abu Simbel and also from Luxor back to Cairo. Our tour also included traveling on a cruise ship up the Nile for 3 nights. We also took a felucca ride, but didn't sleep on one on this tour. The thing you should know about traveling in Egypt is that the traffic is INSANE. In Cairo especially, it will take forever to drive most places and nobody uses the lanes on the road – it's just mass chaos! This is a “comfort” trip, but be aware that “5-star” in Egypt doesn't really equate to 5-star in other parts of the world. The hotels we stayed in often had opulent lobbies and amenities, but most rooms were fairly basic and usually a bit dated. The overnight train to Aswan is similarly not *that* fancy, but perfectly fine. And the cruise ship we sailed on was nice enough, but if you've been on “luxury” river cruise ships anywhere else in the world, this one really won't compare. 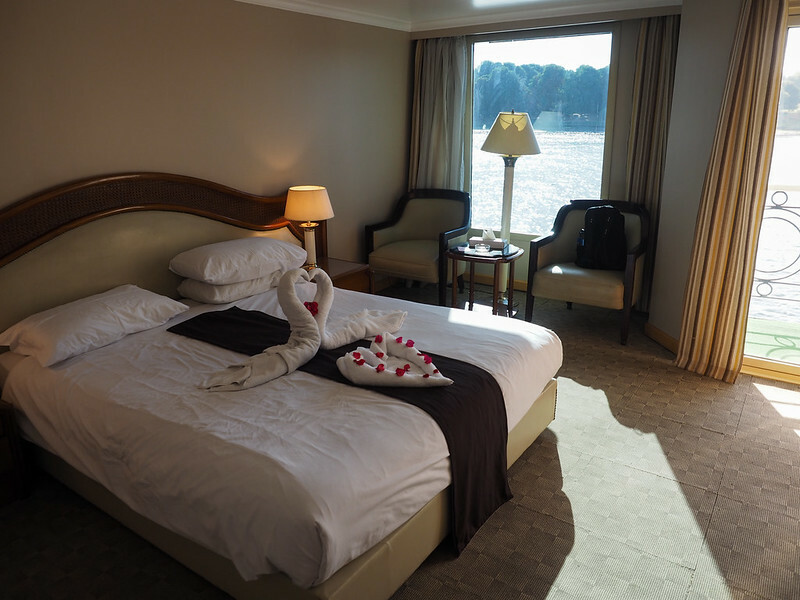 My cabin on the Nile cruise ship (I paid the single supplement to have my own room). If you're traveling solo, you'll be paired up with another solo traveler (of the same gender) as a roommate, unless you pay the single supplement fee. The yellow building was our hotel in Alexandria, right on the Mediterranean. At the end of the day, though, this trip is all about the sites and not really about where you sleep at night. How is this tour different? One of the reasons I keep traveling with Intrepid Travel is because I really like the company as a whole. They are dedicated to responsible and sustainable tourism (they were the first major tour operator to stop including elephant rides in their itineraries), which I am happy to support. On this Egypt tour in particular, we skipped what used to be an included visit to Edfu Temple as we sailed down the Nile because the only way to reach the temple is by horse carriage – and in Egypt, most people don't treat their working animals very nicely. The fact that Intrepid cares enough about animal welfare to remove the temple visit from the itinerary says a lot. 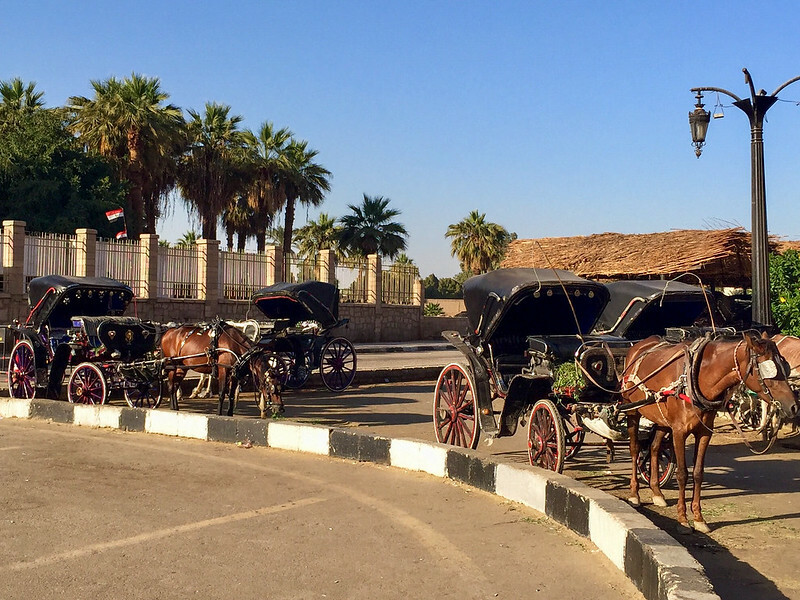 Sad horses in Luxor – Intrepid does not encourage taking these carriages. Instead of visiting Edfu Temple, you now get a ticket to go into King Tutankhamen's tomb instead (which is actually a way more valuable thing to have included!). And you also visit Animal Care in Egypt, an Intrepid Foundation project that offers free animal care in Luxor as well as educational programs for local kids about animal welfare. No country is completely safe, but Egypt is not as dangerous as the media might make you believe, either. There are certain parts of Egypt that are no-gos right now (like most of the Sinai and the Western Desert), and yes there there have been recent terror attacks in Egypt that have claimed lives. But to put it in perspective, there have been terror attacks in places like London and Las Vegas in recent months that have been deadly, too. The main touristy sites in Egypt are no more dangerous than popular places you might visit in the US or Europe. There's a strong military presence at most major sites in Egypt (armed guards, metal detectors, and bag checks become second nature as you visit temples and museums) but I didn't find myself feeling “in danger” at any point during my trip to Egypt. I actually think safety is another good argument for traveling to Egypt on a tour. Having a local guide to look out for us (as well as fellow travelers to hang out with) made me feel much more comfortable overall in Egypt. Absolutely, 100 times YES – both this Intrepid Travel tour specifically and Egypt in general. I loved geeking out over all the ancient sites, and really felt safe and comfortable during the entire tour. I also think that right now is an excellent time to visit Egypt. Tourism is beginning to rebound in the country, but it's still nowhere near the overwhelming levels that it was back in 2010 and earlier. The price: The tour price averages around $2300 per person, depending on departure date. The best time of year to go: Egypt gets ridiculously HOT during the summer months, so I highly recommend visiting as close to winter as you can. I went in late November/early December, and temperatures averaged around 60 F in Cairo, and close to 80 F further south in Aswan and Luxor. What to pack: Read my Egypt packing guide here. Would you travel to Egypt on a tour? I’ve not spent much time in that area of the world at all—other than a short trip to Dubai and a week in Israel—but like you, Egypt has always appealed to me. Shortly before I started working for Semester at Sea, they took it out of their regular rotation, meaning we went to other parts of Africa instead, which was fun but I feel like not going there was a missed opportunity, particularly for students of that age. I’d still like to go, but I think I’d only do it with a tour group. Not sure if that makes me sound like a timid traveler or what, but there are some places, I’d rather my trip be dictated by the professionals who know the place best! Considering I felt the exact same way about Egypt, I definitely wouldn’t call you timid! I agree that there are some destinations where it’s just easier and less stressful to book a tour and let someone else worry about all the details. As someone who often travels alone, this just made the most sense to me! Akatuki! you have shared a very nice post, I would also like to explore Egypt. But is it safe for a solo traveller? I did not travel there solo (and I’m not sure I would feel comfortable traveling there completely solo as a woman), but there are people that travel solo in Egypt without major issues. I’m not usually a group tour kind of person but this sounds really appealing when traveling to an unfamiliar country. I did one in Turkey years ago and was so happy I didn’t go it alone. I’d love to see these ancient sites one day! There’s something to be said for not having to stress out over things like transportation and finding accommodation on top of being in a totally unfamiliar place and culture. I was so glad to be with a guide as well as other tourists – I felt comfortable and pretty darn relaxed the whole trip! This looks awesome! I’ll have to check this out someday. I’ve always wanted to see the pyramids. I had a professor in college who traveled all over the world and lived in many places, but Cairo was his favorite. He ended up living there for 20 some years before coming back to the states and teaching. Very cool! Cairo is a fascinating city, though it’s definitely too big and chaotic for me to ever fall in love with it. 😉 But it and the pyramids definitely worth seeing one day! Thanks to your previous post about your Intrepid Egypt tour, my friend and I are now going to book our own trip for Egypt for this coming Oct/Nov. She was hesitant because of the way Egypt is being portrayed in the media but I pointed her to your posts and kept sending her pictures! Finally wore her down! Can’t wait to see in person all of the sights pictured here. That is so awesome to hear, Ying! I hope you both enjoy it as much as I did! Before I would have huffed and puffed when I read this post about group tours, but after my trip to Cuba I have become a fan. It’s nice to be with likeminded people, and to learn much more about a destination than a book could teach you. I would certainly visit these sights in Egypt with a group tour! I would love to learn more about the culture and the history! I find that you also usually meet some really cool people on group tours – both in the guide and your fellow travelers. I’ve met so many well-traveled people on tours! Truly wonderful trip! It’s nice to see people have started to go Egypt again. Such a wonderful country! I really enjoyed it and am also glad that the tourism industry there is getting back on its feet! This is a great example! Egypt (and Cairo especially) can definitely be an assault on the senses, so having a guide to help navigate things was so helpful and reassuring! This was a fab review! I took Intrepid’s 8 day tour in November and was pleasantly surprised by everything: Egypt, Intrepid, the group, the weather, the food, etc. It was my first week long group tour experience and I enjoyed it for many of the reasons you mentioned. I couldn’t imagine going everywhere we went on my own (and I usually love exploring on my own). The entire trip was seamless. Having a great group and a great guide made all the difference for sure. Glad you had an amazing trip! Glad to hear that you had a great trip in Egypt with Intrepid, too! Would this tour be suitable to take my dad who is a very slow walker and can’t really walk that far anyway? It’s his dream to go to Egypt. Is he just a slow walker, or does he also have trouble with uneven surfaces/steps? There’s not a *ton* of walking on this tour, but there are several instances where you have to go up/down steps and over uneven surfaces since most of the sites are ruins. The only place where you do a bit of walking is at Abu Simbel, since you have to walk downhill to see the temples, but all the other sites include at least a little walking and time on your feet. My wife and I did a month long independent tour of Egypt, Jordan, Israel and Turkey this April and thoroughly enjoyed the history and the diverse experiences of the places we went to. We felt perfectly safe throughout, even in the Israeli towns of Jerusalem and Hebron. Egypt, though, was the highlight – the pyramids, the Valley of the Kings and the Temple at Luxor are just incredible. Glad to hear you enjoyed your trip, too! I still need to visit Jordan and Israel! After reading your blog, my husband and I have booked this Intrepid tour of Egypt to travel in January. We are really looking forward to it. My question is around the visa for Egypt. Did you arrange your visa before you travelled or is it better to go the visa on arrival option? Research seems to indicate there may be issues with e-visas and I would love some feedback. Hey Carol! That’s great to hear! I really enjoyed this tour, and think it’s a great way to see Egypt. As for the visa, if you are from the US, you can do the visa on arrival with no issues (and an Intrepid rep should actually meet you at the airport and help you with this!). If you’re not from the US, then I’m afraid I can’t give any advice since I don’t know what the process is for non-Americans! 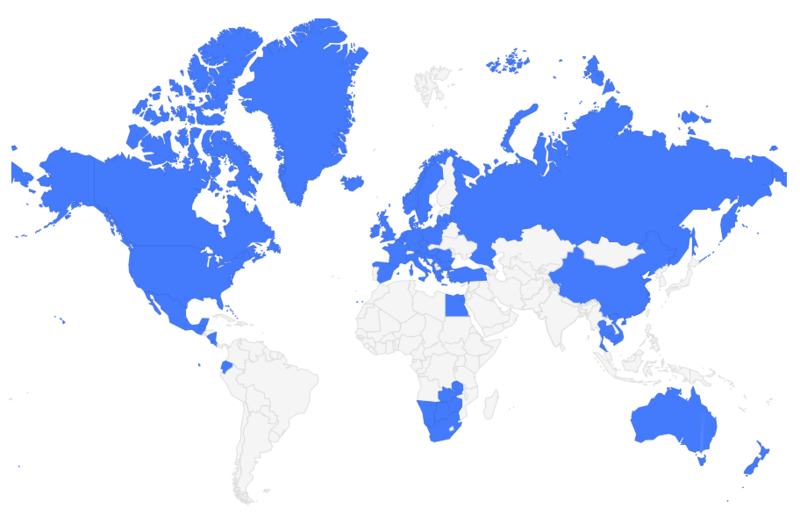 We are from Australia, but the visa process appears to be the same. Good to hear that the Intrepid rep helped with the visa on arrival. We might go with this option. If you’re looking for more of that ancient Egyptian history with temples and tombs, then definitely Luxor – Valley of the Kings is pretty incredible! But if you want more of a modern city feel, then I’d say Alexandria. Был найден мной полезный портал , он рассказывает про www.progressive.ua.